Dr. Douglas and Dr. Gallus discuss the variables that go into cosmetic surgery pricing and the importance of choosing a properly trained and certified plastic surgeon. Hi, this is Dr. Trent Douglas with Restore SD Plastic Surgery and I’m joined today by my partner… Dr. Katerina Gallus. Today, we’re going to talk to you about what goes into cosmetic surgery pricing. This can vary depending on the type of procedure, the length, and the complexity of the surgery. It also depends on the regional market. Expertise and board certification are also factors in surgical pricing. 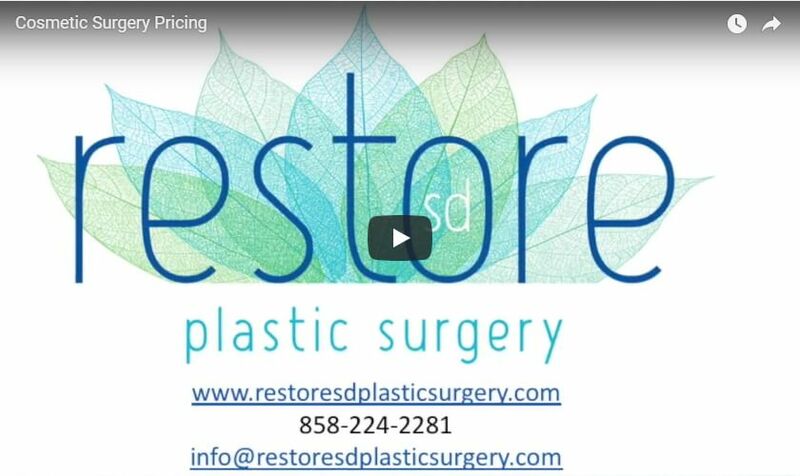 At Restore SD Plastic Surgery, our surgical quote includes the latest technology and cosmetic insurance. Also included are the post-operative garments, Biocorneum Scar Cream, and carbon dioxide laser treatments to the incisions. It is important to do your homework when researching surgical pricing and procedures. Come see us at Restore SD Plastic Surgery.